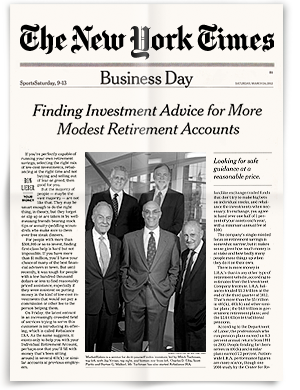 In his op-ed for the Wall Street Journal, Rebalance IRA Investment Committee member Burt Malkiel reveals two strategies that work: broad diversification and rebalancing. For equities, the cycle-adjusted price/earnings ratio, or CAPE—the valuation metric that does the best job in predicting future 10-year rates of return— is about 34. That’s one of the highest valuations ever, exceeded only by the readings in 1929 and early 2000, prior to crashes. Today’s CAPE suggests that the 10-year equity rate of return will be barely positive. Investors have reason to worry, but they need to be aware of two basic facts. First, no valuation metric can dependably forecast the future. CAPEs were unusually high in the mid-1990s, and Alan Greenspan gave his famous “irrational exuberance” speech in late 1996. An investor who bought equities then and held on would have enjoyed a generous 8.5% annual return despite the punishing bear market of the early 2000s. CAPEs were close to 30 at the start of 2017, prompting many market gurus to say stocks were overvalued. The S&P 500 index returned 19% in 2017. A corollary is that no one can consistently time the market. Proper market-timing involves making two decisions—when to get out and when to get back in. Timing both correctly is virtually impossible. As Jack Bogle, founder of the Vanguard Group, has written, “After nearly 50 years in this business, I do not know of anybody who has [timed the market] successfully and consistently. I don’t even know of anybody who knows anybody who has done it successfully and consistently.” Investors who try to outsmart the market more often get it wrong than right. What, then, can an investor do to control risk? The two strategies that work are broad diversification and rebalancing. Broad diversification is rightly known as “the only free lunch” offered by financial markets. By holding a wide variety of asset classes, investors have historically enjoyed smoother gains during bull markets and gentler losses during bear markets. In a diversified portfolio, declines in stocks are often partially offset by stability in fixed-income markets. Real estate equities, available through real estate investment trusts, or REITs, have also tended to stabilize portfolio returns. Most investors fail to realize the benefits of broad international diversification. The world is currently enjoying a synchronized expansion, but economic conditions and stock performance are not perfectly correlated across nations. Internationally diversified portfolios tend to see less volatile returns over time and better risk-adjusted performance. Most stock investors suffer from a “home country” bias. They concentrate their holdings in domestic equities. While U.S. companies do business all over the world, many leading companies are based abroad. The U.S. accounts for well under half of the world’s economic activity. Much of the world—particularly emerging markets, with their younger populations—is growing faster than the American economy. Another reason to consider greater international diversification is that foreign stocks are more attractively valued. The CAPE ratio for emerging-market stocks is less than half the equivalent valuation in the U.S. The emerging-market CAPE is still below its historical averages, despite 2017’s superior market performance. All investors should hold at least 10% of their stocks in emerging-market equities, and allocations up to 25% would not be imprudent today. A final technique to control risk is rebalancing. It’s a good idea to examine your portfolio periodically to ensure your asset allocation has not strayed far from your desired levels. If the strong U.S. stock-market performance over the past year lifted the proportion of domestic stocks in your portfolio to levels that are riskier than desired, it would be appropriate to reduce your equity share. Often capital-gains taxes can be avoided by directing new cash investments (including dividends and interest payments) into asset classes whose portfolio shares have declined. In general, staying the course in a broadly diversified portfolio is the best strategy when all asset classes appear overpriced. If rebalancing is required to constrain portfolio risk, consider REITs and preferred stock. Good-quality preferred stocks yield about 5%, and many have yields that float with interest rates, so that they offer some protection if rates rise in the future. Midsingle-digit returns may seem unattractive relative to recent asset returns, but with valuations at current levels, low-single-digit returns could end up looking good. Perhaps the best advice for investors is to examine your costs. If you are paying an investment adviser 1% and your mutual funds have a 1% annual expense ratio, then fees will eat up a large part of that low-single-digit return. The one thing I’m certain of is that minimizing costs is a winning strategy. The less I pay to the purveyor of an investment service, the more there will be for me. Thus I continue to recommend passive index funds and exchange-traded funds, now available at virtually zero expense ratios, as the best investment vehicles for all investors. Professor Burt Malkiel is the author of “A Random Walk Down Wall Street” and a member of Rebalance’s Investment Committee. This op-ed was originally published in Wall Street Journal on January 22nd, 2018.